It was good to see that most of the main members of the first team squad got a start in one of the two Europa League games against Malmo, but the most noticeable person who didn't was Ki Sung Yueng. Despite all the fuss around Shelvey (I thought the original scepticism when he signed was too harsh and the subsequent euphoria once he's started playing a bit premature) and also the signing of Canas and the renewal of De Guzman's loan, I still think Ki has plenty to offer the Swans. Ki's versatility is a big plus in a weaker squad but now the squad has been strengthened (especially in midfield) it will be tougher for him to get regular action. With Michu and Bony expected to start the majority of games, with Michu filling the attacking midfield role, that leaves two midfield places for Britton, Canas, Shelvey, De Guzman and Ki to fight over. Arguably Ki isn't as good at breaking up play as Britton or Canas or not as much as an attacking threat as Shelvey or De Guzman but there could well be another 50+ games to come this season so he will undoubtedly get some opportunities. Ki had a couple of stand out stats last season, he had the highest overall pass completion rate (92.7%) but also at one stage had the most number of shots (38) without scoring a goal. This was overtaken by Jobi McAnuff who played in all 38 of Reading's league games, had 43 attempts at goal but failed to score. 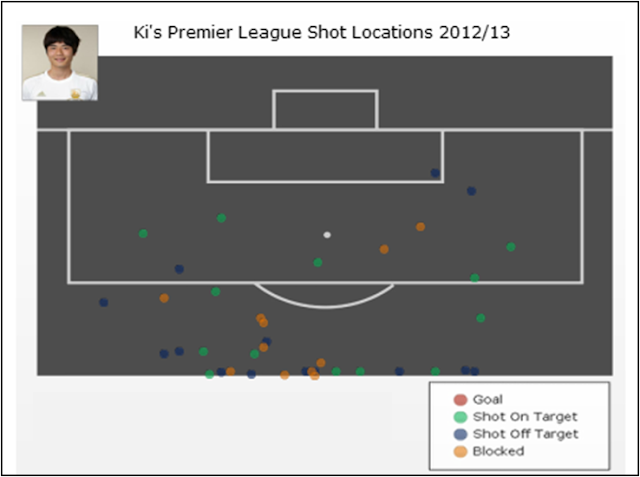 Overall for Ki's 38 goal attempts in the Premier League last season, 13 were On Target, 14 Off Target and 11 Blocked. Looking at when Ki's shots happened, the chart below show's how the lions share comes fairly early on in the season when he played the full 90 minutes in 7 successive games, beyond that shots were relatively scarce and Ki didn't feature in the last 4 league games (due to injury). 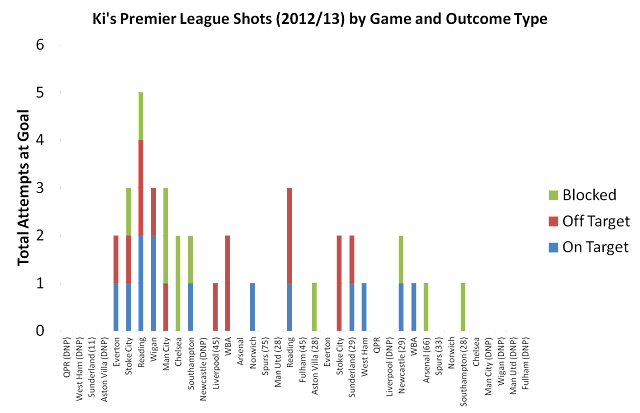 As mentioned previously Ki is a pretty versatile player and played in all 3 (defensive/central/attacking) midfield positions at various points in games across the season so this change in shot volume is not necessarily a tailing off in performance and it should also be noted that after playing the 7 full games in a row, around half of his subsequent games were not full appearances. That said, there did seem to appear times later in the season when he was hesitating to shoot but that could easily just be because it was something in particular I was looking out for rather than any real change in attitude. Going beyond shot volume, I've had a look at where these shots were taken and it helps to add to the understanding of why Ki failed to score last season. The figures below are rough estimates cobbled together using Statszone but a number of Ki's efforts were so far out they didn't fully appear on the Statszone chart. From the chart you can see that the vast majority of them are 'hit and hope', the kind you might score around 3-4% of the time (if that), there's only a couple of attempts that could be classified as 'prime' positions and even then there's likely to have been plenty of bodies in the way. I've produced an interactive version of the chart above where you can highlight any of the attempts to show which game they came from (I'm hoping to do more interesting versions of this as the season goes on). The interactive version is located here. Getting back to Ki, I think there's still plenty to see from him this season: as well as the volume of games, I can see Shelvey getting the odd red (as will Michu if he tackles like he did in the 2nd leg against Malmo) and there will also be games where only one of Bony/Michu starts and an extra man in midfield may be needed or where Ki's ability is required to close games out where Swansea are ahead with 20-30 minutes left.